Do not think ill of me for the secrets I am about to reveal. It was all due to chance, mere chance. Had I left work later or even earlier, had I gotten on a different train, or had any number of different variations of that day occurred, none of the following would have ever been revealed. That I found the diary and witnessed who had mistakenly left it behind could hardly stop me from taking a peek. And once I began, how could I stop? It was a Willy Wonka river of chocolate and I was a greedy Augustus. It contained the words of two strangers: a novelist and his admirer. Both seemed as if they were speaking to me. There has never been a person in an old people’s home that hasn’t looked around dubiously at the other inhabitants. They are the old ones, they are the club that no wants to join. But we are never old to ourselves. That is because at close of day the ship we sail in is the soul, not the body. Of the men whose thoughts I was invading, I didn’t know either from Adam. But by the time I would finish, I could no longer pretend that we were strangers at all. The diary of the man in the long black coat began. . . . I bite, helplessly. It’s the reaction-inducing bait of letters. The weave of the page and its words. Sentences, past and present, ring bells from the impossible reach of cathedral spires. It makes me think again of poetry. Unchartered lands. Perpetually beyond my feeble grasp, poetry ensures an endless lure while frustration inevitably continues to push me further and further away from its secrets. If there was a trap door to its magic world, I had yet to find it. What I was always left holding was simply intrigue, but intrigue is a helpless bedfellow to true understanding. But again, a funny thing happens. The likes of John Banville and Sebastian Barry reveal poetry in prose that inch me closer. Sentences dance round fantastic journeys of discovery. Their power and purpose is transparent: to mesmerize poor souls like me. They are the gatekeepers of trances. All who fall under their spell are pushed deeper into their rich characters, places, and times. Anyway for my sanity I am writing here. I am sixty-five years old; past the Beatles song. By some accounts this is young. But when a man wakes on his fortieth birthday he may safely say he has no youth ahead of him. The phone rings. Or is it the doorbell? No matter. I ignore the outside world as I am completely lost in the discovery of the secrets I have stumbled upon. Sixteen candles morph into forty. I am dizzy old in the dizzying warp. Stumbling upon morbidity, I ponder the strangest things like guesstimates of the exact number of books I will read before my passing. Pages, life, and death. All the while, I continue to try and sift through the debris and dust it all off in order to pay tribute to those, to the best of my recollection, that have had the greatest impact. All the while wondering how many others lie in wait. They say the old at least have their memories. I am not so sure that is always a good thing. I am trying to be faithful to what is in my head. I hope it is trying also to be faithful to me. I cannot say that he doesn’t begin to lose me a bit, but this only serves to draw me in further. He writes of a novelist who has baited him, and so it is with his diary for me. I take the bait. The words of a stranger hold me in their grip and I refuse to look away. I choose to read on, wondering if reading on is perhaps what has been chosen for me. Most everybody knows the story about time and the precious little. Grandma’s bones are a quick study. Tick-tock, thirty, fifty. . . . Thinking about time is like pushing Pause on the DV-ideo tape rec-assette deck. A lock of Pause. I suppose that is what thinking about the drain of time really entails. We are left pushing Pause, on and on, the story doesn’t change at all. Time stands still. Time is time is time. Push Play and move on with it. It is then that the never-ending collision of memories crash back into the always unpredictable future. Today, yesterday, tomorrow. I am old enough to know that time passing is just a trick, a convenience. Everything is always there, still unfolding, still happening. The past, the present, and the future, in the noggin eternally, like brushes, combs, and ribbons in a handbag. And so I choose to veer away from any more discussions of time. It can hardly be a container big enough to hold the answers. His words, their words, reveal a sadness that touches me deeply. I begin to think that he is less and less a stranger with each passing page. When I see him again, I want to tell him all this and more. I want to confess to him that I have invaded his secret world, but that I am not completely sorry because it has awoken something in me. But when I do see him again just a few days later, diary still in my possession, I look the other way. To him, we are nothing more than strangers on a train. I dare not reveal my sins. There is a moment to speak to a topic, just like there is a moment for every song, no matter how rare. There are times I wonder if he even knows that it is missing. Maybe he thinks it is simply misplaced. That it will turn up sooner or later. And again I wonder if it was not the diary that found me. I wonder why anything is. 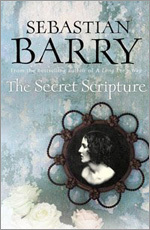 There were so many pages in Sebastian Barry’s “The Secret Scripture” seemingly addressed to me. Of course, that is just a passing thought. Vanity. The moment I finish writing it, it is gone. As if the ink—the final dot on the “i”—represents nothing more than one last thought’s final breath. And yet, knowing of course that these beautiful words have not been gift-wrapped for me does not stop the river from flowing. Like when he speaks of the universality of grief. The real comfort is that history of the world contains so much grief that my small griefs are edged out, and are only cinders at the borders of the fire. I have since seen him often. He gets on the train at Belmont. And every time I see him, I take a deeper breath to try and swallow my shame. And yet, I cannot look away. Morality has its own civil wars, with its own victims in their own time and place. I am desperate to find a way to return what is rightfully his, even though I know that ship has long since sailed. The train approaches Belmont as my heart begins to race.